Rio’s annual extravaganza - the most famous carnival of them all - attracts millions of people from all over the globe. Carnival begins with the mayor handing over the keys of the city to King Momo in the presence of royalty. The King then announces the beginning of carnival celebrations, a time when the entire city erupts into one giant party zone! Although the main carnival parade takes place in a dedicated area known as the Sambadrome, Rio is alive with street parties and sophisticated carnival balls. Carnival is held in the run up to Lent, starting on Saturday and ending on Shrove Tuesday, or “Mardi Gras”. Dates for 2019 are from 2nd to 5th March with the main carnival parades taking place on Sunday 3rd & Monday 4th March. The parades start in the mid-evening, and continue well into the small hours of the following morning. Experiencing it first hand is a great way to get a taste of true carioca entertainment. 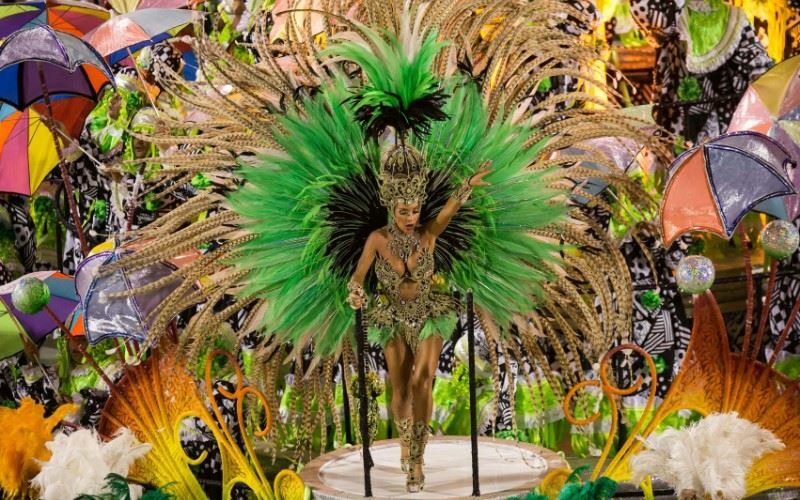 While the carnival evolved over time during Portuguese rule, the carnival that is keenly observed throughout the globe today has a great African influence. African slaves that were brought by the Portuguese introduced music, dance and drum beats that eventually saw the birth of samba, which was quickly adopted by Carnival organisers. It presents the perfect opportunity for samba schools to showcase their talent. The Sambadrome was designed by the renowned Oscar Niemeyer which consists of seating on both sides of a runway on which samba schools have 80 minutes to put up a grand performance complete with elaborate floats, costumes, musicians and dancers in a bid to score points from judges (panel of 40 judges) and ultimately the Champion of Champions title. Each school presents a theme around which they develop their own samba song. Arrive at Rio airport and transfer to your hotel in Copacabana for 4 nights. Overnight at PortoBay Rio Internacional Hotel. Day at leisure. Rio has one of the world’s most spectacular settings with famous beaches, a stunning mountain backdrop and the towering statue of Christ the Redeemer overlooking the lives of its 6 million plus inhabitants. You can explore the beaches of Copacabana, Ipanema and Leblon on foot, and watch the “Cariocas” at play; alternatively, take the cable cars up Sugar Loaf Mountain or take the tram to the historic Santa Teresa District. Eat out at a Churrascaria or enjoy a typical feijoada, a stew with black beans, washed down with a caipirinha! Rio has long been a magnet for people who want to live life to the full. The whole city seems to gather on the magnificent Copacabana beach to play football and volleyball. The city is a feast for the senses in every way! In the evening, transfer to the Sambadrome to watch the carnival parade (and return transfer to hotel). Day at leisure. Continue your exploration of this vibrant city. Evening transfer to the international airport for your departure flight.